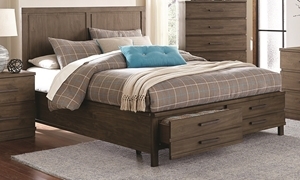 Simple king panel bed crafted from solid pine features two dovetailed footboard drawers on smooth, ball bearing glides for storage. 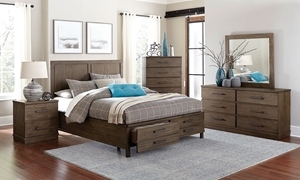 Queen sleigh bed with decorative metal accents accompanied by an 11-drawer dresser and matching mirror in a rustic umber finish. Solid mahogany mirror and matching dresser with six full-extension drawers and two cabinets showcasing rustic louvered details. Farmhouse-style bedroom suite in a sophisticated black finish includes queen poster bed with USB charging, mirror and 6-drawer dresser.